but if you are in an alleyway, it drops to 25 MPH. the speed limit increases to 70 MPH. the speed limit will typically be 60 MPH. 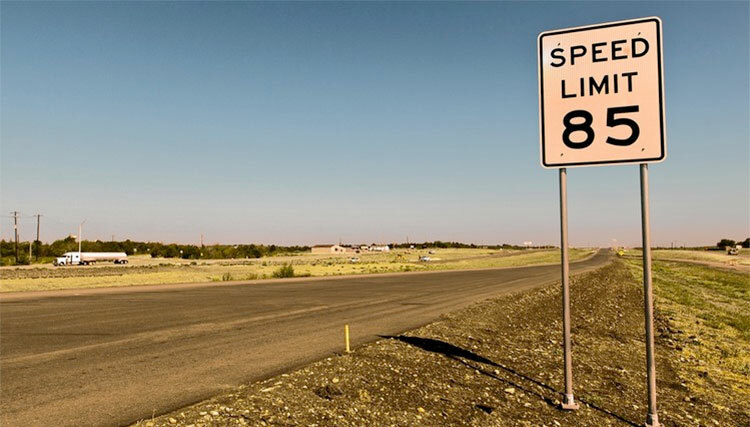 While the previously mentioned speed limits are defaults, there are many instances where Texas speed limits are lower than these. The subsequent section of the Transportation Code allows cities and municipalities the ability to alter the speed limits based on the conditions of the area. Although these speed limits appear to be set arbitrarily, the limits are actually based on engineering and traffic studies required by the law. These studies must determine a speed that is both comfortable and safe for the majority of drivers. To arrive at these speed limits, engineers must determine the speed drivers travel on the road. Then they must set the speed limit 85% of the drivers are traveling at or below. If special hazards exist such as a high occurrence of accidents on a particular road stretch, hills, or curves, the speed limit can be set beneath the 85th percentile limit. Because of these various conditions, it's vital to always read the speed limit signs. At the same time, this tells you about the detail and intense considerations put into determining a reasonable speed for the road.